What is a Twitter Emoji Campaign? Twitter emoji campaigns are a visually smart way to separate your hashtag from other hashtags. As the name may imply, they aren’t permanent additions to a brand’s main hashtag, but rather are centered around a specific campaign that the brand is putting out. For a price tag of $1M, Twitter will—for 90 days—attach a picture that you provide to a hashtag of your choice (given it doesn’t infringe on anyone else’s IP, of course). 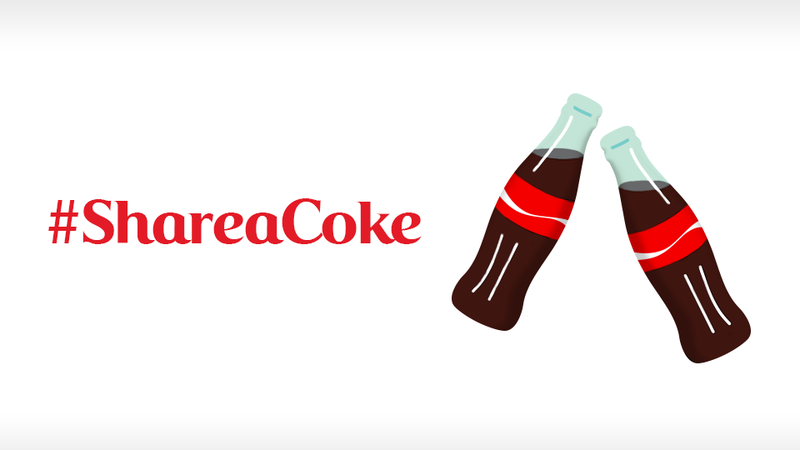 On-the-nose advertisers may remember the tremendously successful #shareacoke campaign, one of the earliest campaigns to combine an emoji with a hashtag. The campaign created waves that led to the immediate introduction of other emoji/hashtag combinations. But how worth it really is it invest in a Twitter emoji campaign? Since the #shareacoke campaign debuted in 2015, the number of hashtag/emoji campaigns has skyrocketed up; what value do these little emojis hold that are making them mass hits? Having a visual next to your hashtag will instantly create an association in people’s mind, and creates hype around the campaign. It separates your hashtag from other hashtags that may be similar, and even after the campaign ends, people will be left with the imprint reminder of your campaign. Additionally, it allows the user to create an emotional bond to the campaign that a text-only hashtag simply would not be able to achieve. The reason emojis are so popular is because people connect to them emotionally. Is your campaign cool? Funky? Nostalgic? Whimsical? The Twitter emoji’s art style paired with your hashtag will help determine this, and will shape how people perceive the campaign overall. Yea, it’s that important. A hashtag creates a quick avenue for a community to be built around the hashtag, and in turn around your campaign. Once again, the visual element greatly helps people quickly recognize the hashtag, so they’ll be able to click on it and begin to interact with others who are also using that hashtag. This creates a feedback loop where those who are interacting with each other build on the conversation and continue to use the hashtag, keeping it active for others to see in their timelines and become interested in! Twitter users cumulatively generate millions of tweets a day, so the average user is scrolling quickly down an array of hashtags. Internally, Twitter refers to tweets and hashtags that hold people’s attention and pause them in their action of acrolling ‘stopping power’—essentially, it’s a level of retention that determines how effective a campaign is going to be in a user’s mind. Twitter found that the stopping power of tweets with emojis increased by 10%, and if those tweets were promoted, that figured jumped up to 6x their previous impressions. Lovingly rendered above are #Pooh, #ItsPiglet, #Eeyore, and #Tigger! 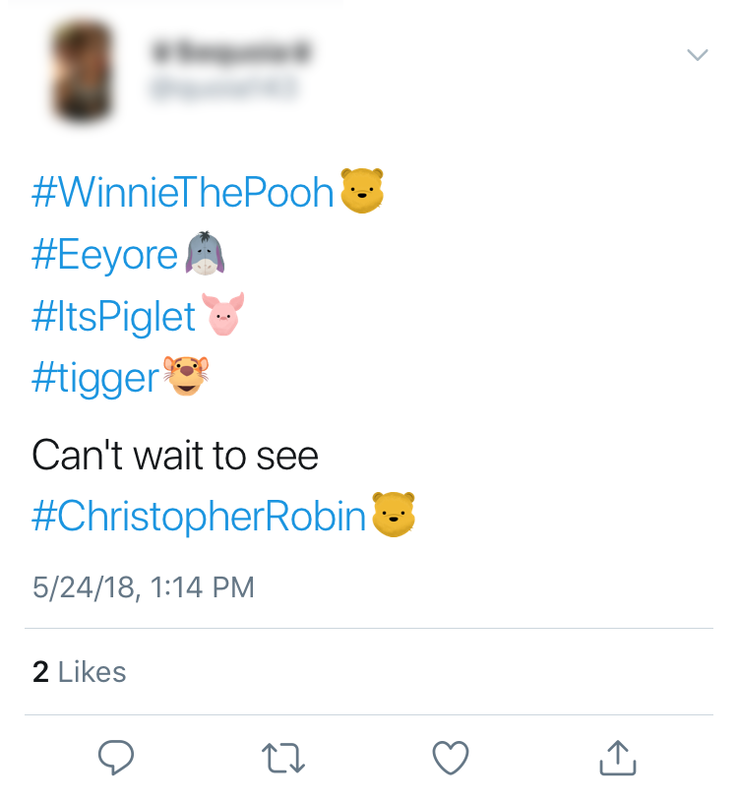 All for Disney's #ChristopherRobin! 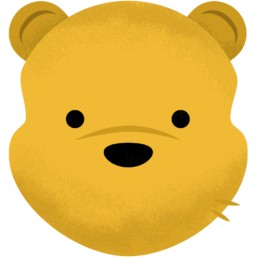 This was one of our first Twitter emoji campaigns, as well, so we were very excited and curious to see how it would fare. 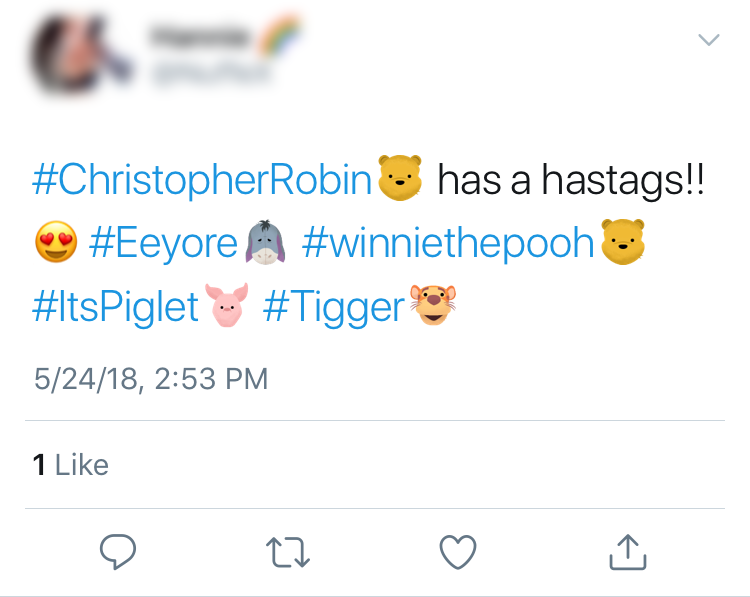 The thought was that users would have an emotional reaction to the characters’ faces and thus use the hashtags because of it. Once the hashtags were live, we monitored the hashtags to see how they were doing. Sure enough, almost immediately we began seeing tweets that reflected nostalgia beyond what we even expected. Some users were tweeting specifically for seeing the hashtag characters! So for your brand’s next ad campaign, consider utilizing the power of Twitter emojis! And if you need someone to help you out, hit us up! It’s every brand’s dream to stand out amongst the crowd, and every marketer’s goal to help their brand achieve that dream. 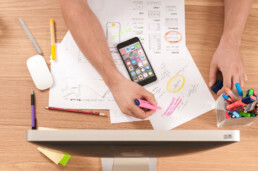 In today’s world of exponential technological breakthroughs, marketing strategy has by necessity been evolving to complement—the Internet is the newest frontier for marketers looking to expand their brand. However, changes in marketing aren’t always revolutionary; sometimes, even little changes have a large impact on a brand’s identity and tone, and thus, the relationship with their consumers. Pop-up and targeted ads, a long stalwart of advertising and marketing, have become taboo so companies are now looking to the next best strategy. People don’t want to be sold things anymore; in the new, transparent age, they’re looking for genuine connection. Emojis are ubiquitous in today’s world; which means there’s one for any demographic you’re looking for. They come in different skin tones, in a huge amount of objects, places, and even in travel symbols and signs. They add personality to otherwise-bland text and catch the attention of the community your brand is trying to appeal to because they’re connecting to the image on some emotional level. Which one of these catches your attention the most? 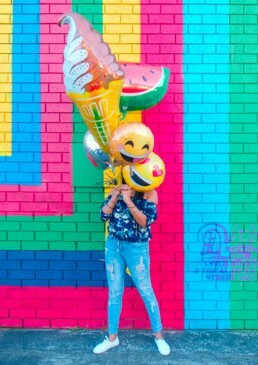 Emojis are also the perfect way to show HOW you are saying something; emojis can be used ironically and sarcastically, which in itself helps frame the brand’s relationship with their consumers: are they cool and edgy? Professional? Fun? There’s an emoji for that! There is no genre barrier: apps like CNNMoney have fully adopted emojis, with over 50% of their push notifications including at least one. In general, companies who’ve been early on the trend and incorporated emojis into their notification headlines have already received tangible, data-driven results. According to a study conducted by the entertainment platform LeanPlum, consumers open push notifications with emojis 264% more often than those without. Email subject lines that include emojis are opened 66% more, and applications that incorporate emojis receive a 26% lower uninstall rate. Which one of these jumps out at you? 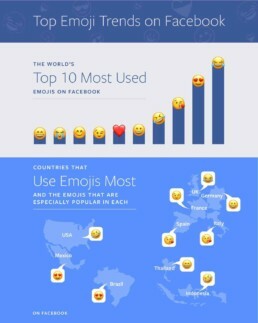 In short, emojis drive engagement. There is no aspect of a company’s goals that can’t be improved by adding a little emotion to help their consumers connect to them on an emotional level; whether the goal is to get hits on a webpage or sell a product, emojis can unify and enlarge your audience and their retention of your content. Emojis aren’t going anywhere; Twitter emoji campaigns, which allow brands to publish an image in tandem with their hashtag, have caught fire and are only picking up traction. Platforms like Slack allow users to upload their own, specific emojis so people can message in-jokes to each other. Emoji use and variance is evolving, and the farsighted brand will take measures to ensure that in a world where brands emote, they aren’t seen as ❄️☠️💤. In the modern mobile world, everyone knows what an emoji is. There’s a “standard set” of emojis we’re all familiar with that are available whether you’re using your iPhone, Android, or computer device, with new ones rolling in and even personalized-to-app emojis. However, do you ever stop to think about how new emojis are added, or who even came up with the old canon? They’re just there; one day they weren’t, and the next day they were! Read onwards and have the mystery of the Emoji Code unraveled! 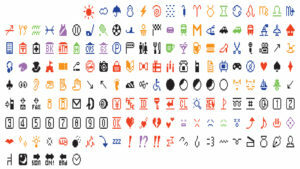 Designer Shigetaka Kurita invented the emoji in 1999 to circumvent NTT DoCoMo’s message-character limit (at the time, 250, a la early Twitter). He drew inspiration from picture-based Chinese “Kanji” characters and, armed with a 12x12 grid, created the first set of emojis using common expressions and thoughts he felt were relatable and cute (and would save textual space!). This set was immediately introduced into most of Japan’s mobile products, but their competitors soon took artistic license and released emojis of their own; copying Kurita’s expressions but rendering them in a different style. Shigetaka Kurita, NTT DOCOMO. Emoji (original set of 176). 1998–99. Software and digital image files. Initially, this caused quite a bit of chaos and miscommunication because a user of one company’s emoji could not see any other another company’s emoji. However, in 2005 carriers began to match incoming signals with their emoji sets and switch them over, and after Apple’s 2007 iPhone globalized them, the Unicode Standard was created so that your poop emoji will send to any device. New emojis introduced into the existing canon are decided by the Unicode Consortium, which sounds like a bona-fide secret society right out of a sci-fi novel but is an actual, real-life organization whose goal it is to enable everyone to be able to use a computer and express themselves with pictures! However, the individual designs for the emojis are left at the discretion of the companies making them; the biggest players being Apple, Microsoft, Samsung, and Google. As a result of this, each of these big-name platforms (and other smaller-name ones) has their own emoji for the same expression. Obviously, squirt gun to lethal gun emojis can totally change the tone of a message and actually cause confusion if two users were receiving different images. It’s worth noting that Apple was the forerunner in changing their gun emoji to the squirt gun we see now. After Apple changed theirs, most companies followed suit partly due to personal value but also because they are trying to create an emoji culture where there is as little confusion as possible, a mission that as designers ourselves we can absolutely appreciate. 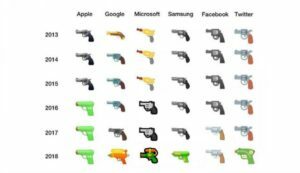 Facebook has also announced that they will be removing their gun emoji and replacing it with a squirt gun, although that change hasn’t happened yet. This means every major platform has changed from a real gun to a squirt gun. Marketing is constantly evolving around the consumer, and during the Age of Technology it’s evolving at a more rapid pace ever; it can be difficult for marketers to know whether or not they’re on the uptake or being left behind. 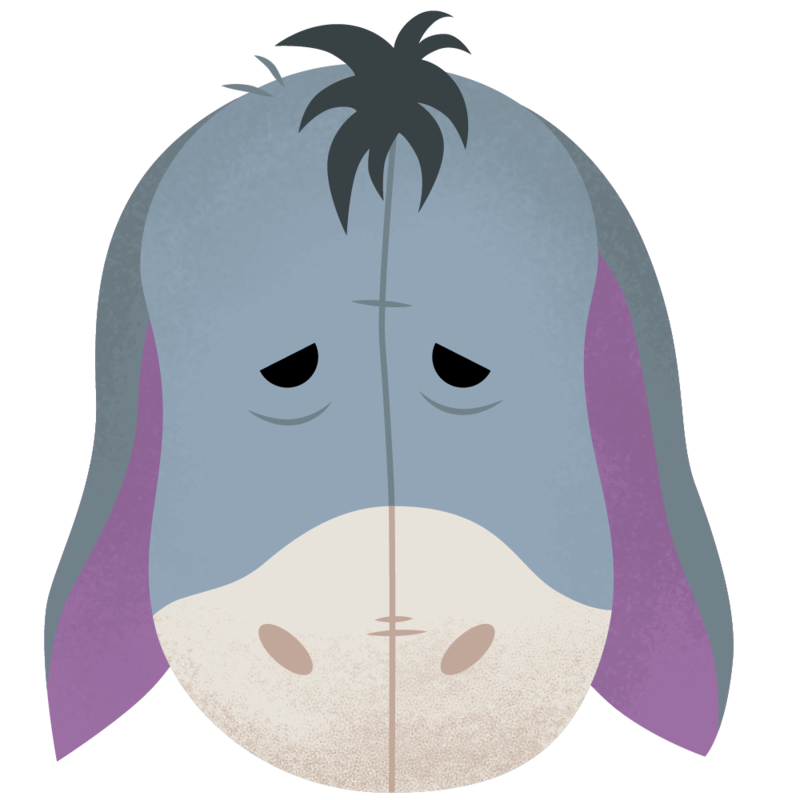 Perhaps the most underrated game-changing tool for marketers are animated stickers and GIFs. Although many still use video, this format is frankly out of date for the modern internet user. According to a survey conducted by Harris Poll, a whopping 71% of Americans would rather send a digital sticker over a block of text. With such a large user base, it’s no surprise more and more companies have been seizing the opportunity to make branded stickers and GIFs to seamlessly integrate their brand into their consumer’s daily life. We partner with these companies to make their brand come alive within mobile conversations. However, not all companies are aware of the wide gamut of opportunities afforded to them across platforms or the sheer flexibility stickers and GIFs inherently have. Companies can pay Twitter to attach a custom emoji to a Twitter hashtag for a period of time. Then, whenever someone uses their hashtag the emoji automatically comes with it! The brand’s hashtag instantly stands out with its unique emoji and helps create a community around the product. 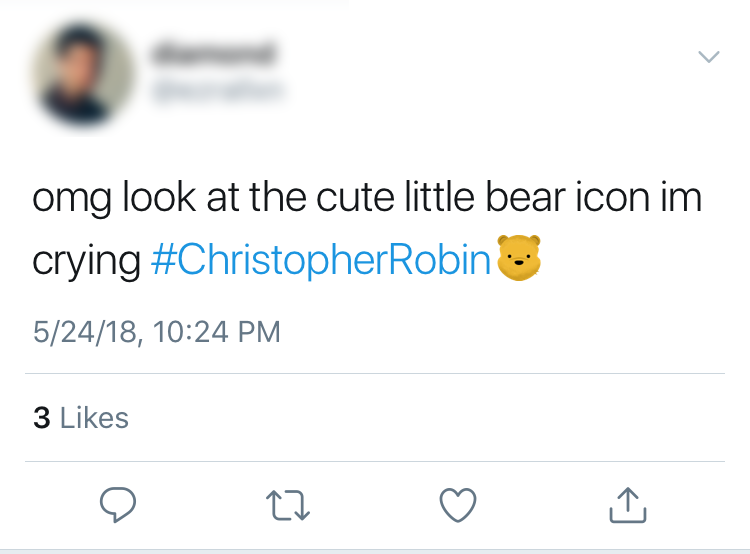 Recently, we collaborated with Disney on a campaign for Christopher Robin, including creating a range of twitter emojis to promote the film and make the hashtags appealing, relevant, and most importantly create the cute Pooh-bear association to the Christopher Robin movie in people’s minds. We managed the storyboarding, sketching, and illustration for these emojis. A branded sticker campaign’s main objective is to organically increase brand awareness and engagement. To that end, stickers are a revolutionary tool because it enables marketers to have their brand present in their customers everyday conversations across mobile. In other words, their brand becomes a permanent part of their customer’s life. A good example of this is Lovate Health’s MuscleTech stickers, promoting their MuscleTech brand of products. These stickers are centered around and cater directly to the consumer base that uses MuscleTech products; as a result, they end up using them a lot because the sentiments and in-jokes are relevant to them. This entrenches MuscleTech further into the community in a feedback loop that keeps both the company and the consumer happy, and helps new initiates to the community naturally find their product in a sea of competitors. Lovate Health has taken it even further by making their stickers clickable. These stickers, when sent, allow the receiver or sender to click the sticker and be redirected to a website, the app, or the app store. This is brilliant because users are able to interact with the images being received and has quick access to the company’s brand. They also allow people to send links to products they enjoy in a fun way! Stickers and messengers go hand-in-hand, creating a demand for sticker marketplaces, which offer a wide variety of branded emojis and keyboard and almost functions as an advertising playground. In 2016, around 50% of all mobile users used at least one form of mobile messenger, according to Stastia. The fact that since then, messenger apps continue to add free features like video calls, encryption and social media means that usage has only been increasing. Sticker marketplaces have also grown in kind, and many of mobile messengers have created their own sticker markets that draw users to their specific platform. Apple and Facebook are leaders in this industry with their respective iMessage and Messenger platforms; in total, over 1 billion stickers sent on them. We’ve has observed the intense popularity of stickers it created for the mobile game Plants Vs. Zombies, which had 1 million downloads 4 days, and 2.5 million downloads in a week with over 100 million impressions. This was touched upon briefly in point number two, but one of a branded sticker’s major selling points is the seamless integration into a consumer’s life: in other words, converting that customer into a brand ambassador. 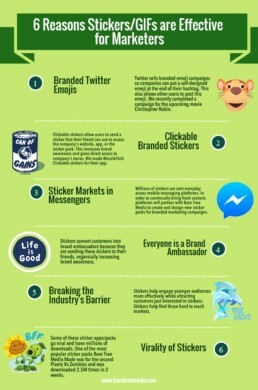 This is one of the most effective ways of creating brand ambassadors because people are sending these stickers to their friends organically; they love the content and they are spreading the brand to all of their friends in a win-win scenario. Furthermore, people who are friends tend to be in similar target markets, which means having stickers so your customers can share your brand with their friends is the ideal way to spread your brand. Stickers are an important bridge that connects companies to a younger audience in a charmingly appealing way. In an age where this younger audience has been collectively groomed to ignore the millions of ads they see every day, stickers appeal as authentic and fun, leading more of this audience to be attracted to and spread your brand (in the form of stickers). Sometimes you even get people who were previously unaware of your brand but will buy sticker packs because of artistic appeal or funny witticisms, which could convert them into customers. If not, they’ll at the very least be creating more brand awareness for your brand. Some of these sticker apps/packs go viral and have millions of downloads. Although not a guarantee, the possibility is always there and because stickers are created to be spread on the internet, where the phenomenon of “going viral” first appeared and retains the farthest reach, it is a direct line to the culture that facilities going viral. Overall, the existence of stickers as a marketing tool has opened a completely new avenue for brands and consumers to communicate through. Instead of having their message get “lost in textlation”, customers can augment their thoughts with your brand, without losing what they want to say. Most importantly, they can do it in a way that feels fun and cool and makes them feel good, which will push them to keep doing it. People can show who they are by sending stickers of TV shows, music, or quotes they like from pop culture that curate their personality by showcasing the communities they’re a part of and appealing to others like them. In layman’s terms, stickers/GIFs are great for showing some personality! Recently, custom emojis have been sprouting up on all major messaging platforms like Apple, Google, Samsung, and Snapchat. These were started by Bitmoji, a company that allowed users to create their own personal emoji. Once Snapchat acquired Bitmoji, the race was on for all major messengers to create their own. These personal emojis are used by a wide range of age groups and are some of the most popular stickers. Bitmojis were the first personalized emojis to take messaging by storm. They were designed to fill the gap between selfies and text messages by sending a personal sticker that could express emotion. 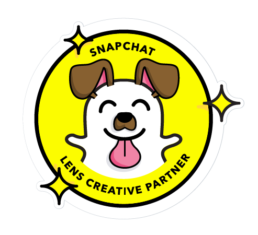 This idea took off and was acquired by Snapchat to become the avatars for all Snapchat users. Bitmojis were a massive success and are now on most major messengers as well as Snapchat. 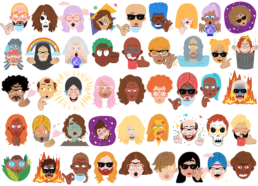 These custom stickers led to most major messengers adopting their own personalized emojis. 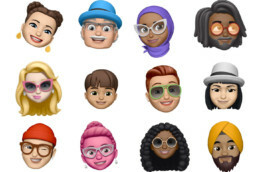 Apple is currently testing their new personalized emojis that are expected to be released with iOS12 called Memojis. 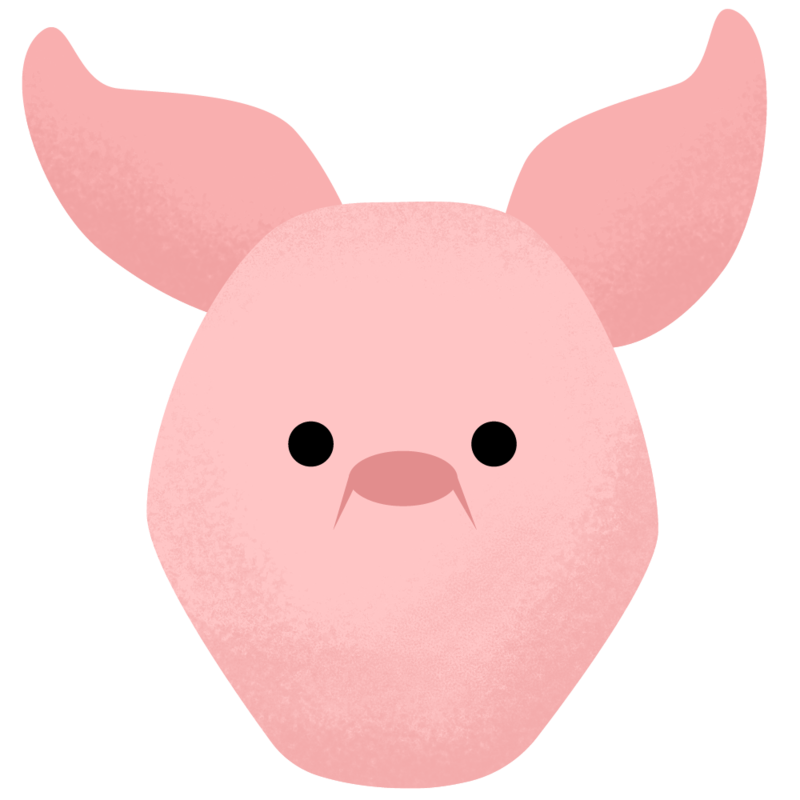 Previously Apple launched Animojis, which were animated stickers of the user’s facial motions illustrated by various animals. Memojis, are an extension on these animated stickers, by allowing users to use their animated character. This movement is then translated to your Memoji on your screen, creating your own personal animated sticker. The Memoji’s are completely customizable to make your own unique animated messages. Samsung Augmented Reality (AR) Emojis allow a user to create their own personalized emoji. These emojis are able to be customized with different effects that make the sticker look more cartoonish or more lifelike. Samsung also gives you the option to change the clothes of your custom sticker. Recently, Samsung updated their AR Emojis with the addition of 18 more set stickers to add onto your emoji, making the total 36. Right after the release of these extra stickers, Samsung also announced they will be launching 18 more additional stickers soon. These personalized stickers are only available the Galaxy S9 and S9+. However, creating custom stickers is not the only thing that AR Emoji allows a user to do. It also has a feature that brands can utilize, like Disney who released some of their classic characters like Mickey Mouse and Donald Duck onto the platform. Then Disney followed up with a release of the Incredibles characters to promote the newly released sequel to the film. Google recently announced that they are launching a keyboard add-on called Minis that allows users to send customized stickers of themselves. The user will take a picture of themselves and a digital sticker of them will be created. Google is taking a unique approach to their customizable stickers. Unlike Snapchat and Samsung, Google Minis will have packs to purchase containing different gear and backgrounds for your personal sticker. Currently, these custom stickers are only available in the Beta keyboard, however, we should expect to see them soon. It is 2018, and Emojis have taken over. The once perceived “silly, childish” messaging stickers have become completely integrated into our daily conversations. Snapchat filters even let us turn ourselves into our very own Bitmoji. 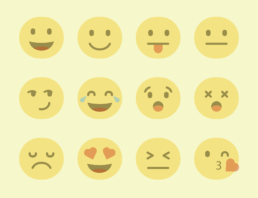 Emojis allow us to demonstrate feelings and emotions to a greater specificity than our words. Here at Bare Tree Media, we pride ourselves on being the original and the longest-standing emoji designer. Day in and day out, we work to give everyone the ability to say just what they want (with OR without words 😉). It seems with each new day more emojis are created by designers across the globe providing each of us with unique ways to express ourselves or just have fun! World Emoji Day calls for big news, and companies have delivered. Apple Inc. announced they will be releasing Emoji 11.0 for iOS and MacOS, an emoji pack including 66 new emojis for Apple fans to enjoy in late 2018. Along with these new emojis Apple is also releasing their Bitmoji counter, Memoji. The 3D emoji will be available with iOS 12 this fall. 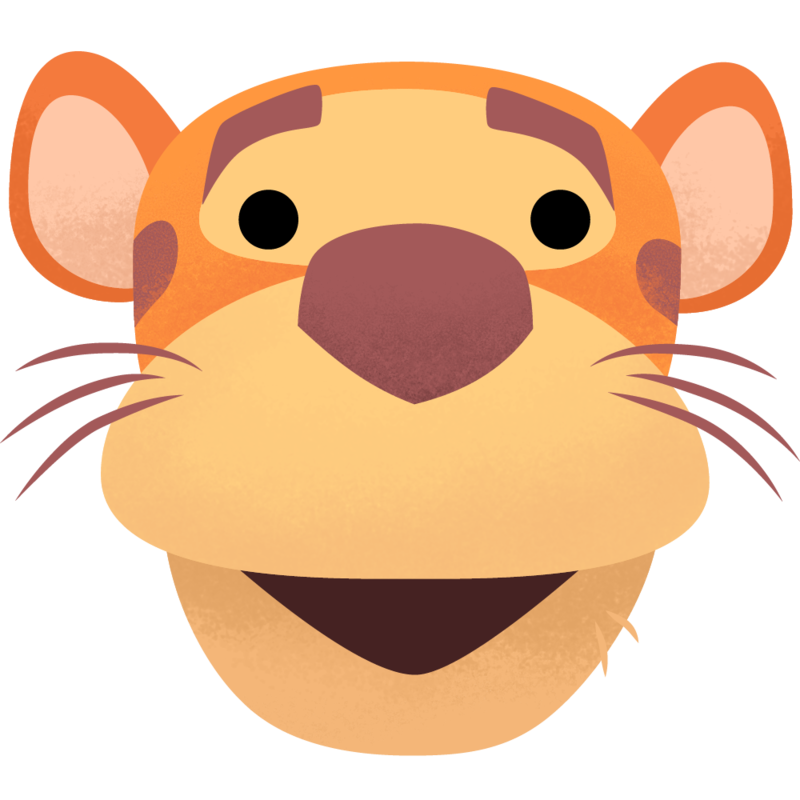 Memoji’s are to follow-up Apple’s animated stickers that use facial recognition to overlay animal filters, Animojis. Memoji’s take the next step and allow users to create and use their custom Emoji stickers to express themselves in a unique audio-visual hybrid. With innovations like these, developers are reimagining where and how emojis can exist, proving the only way is up. Emojis have made their mark on our society, and now large companies are working towards making their own mark through branded emoji stickers. Recently, Twitter teamed up with Disney to release custom emojis of the upcoming movie Christopher Robin and chose us to create them! 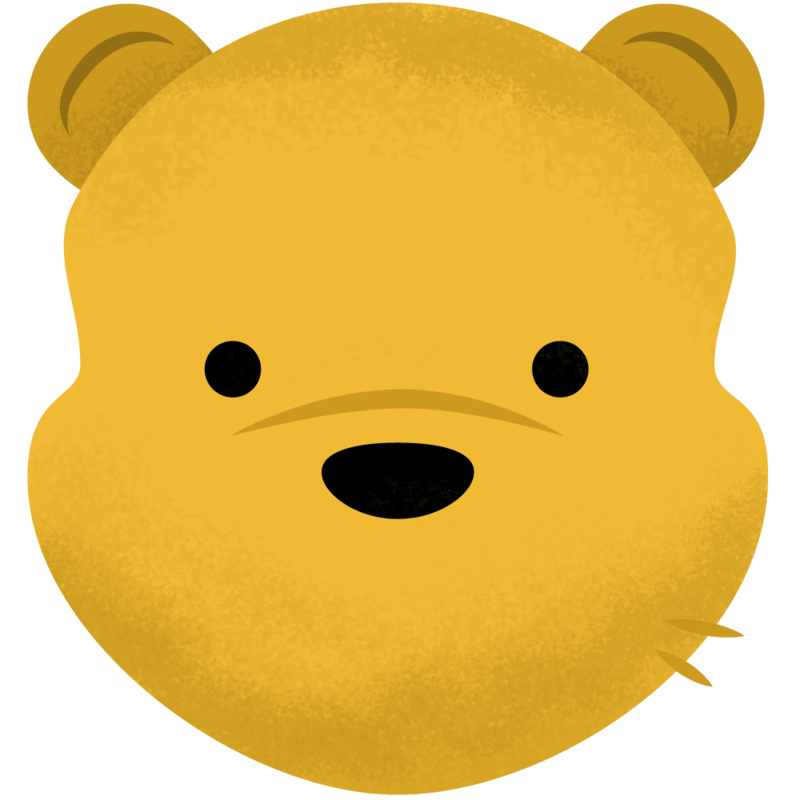 Each of core 100 Acre Woods characters got their own little emoji to accompany their hashtag. 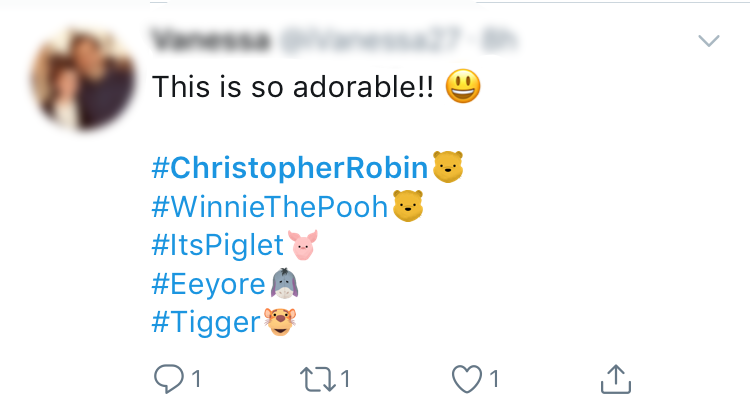 Tweets including #ChristopherRobin, #Pooh, #Tigger, #Eeyore and #ItsPiglet grew in number. 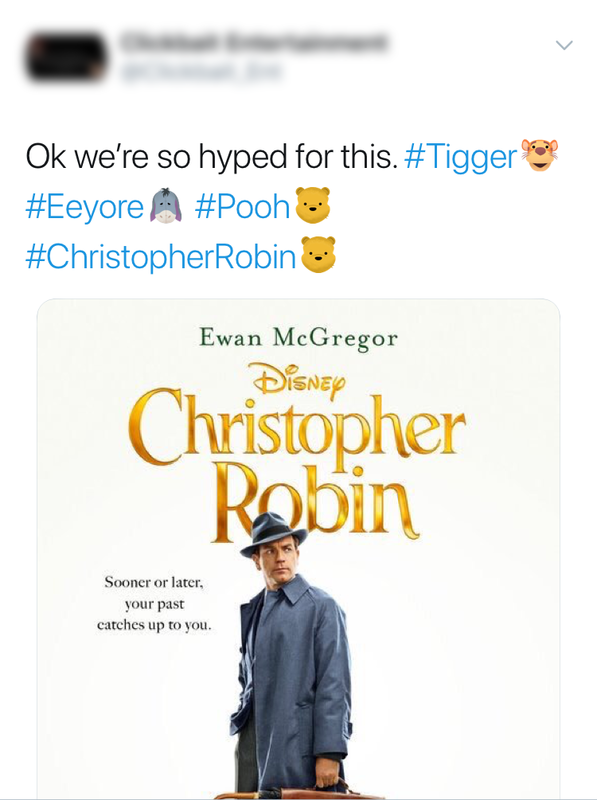 Twitter users that might not have engaged with tweets involving the Christopher Robin movie in a normal situation began tweeting about the movie. Some solely so that they could have the emojis on their feed! Join Us and Share Your Favorite Emoji with Bare Tree Media on Facebook, Twitter and Instagram!